So, I’ve seen a number of people posting this September about the “Dungeons & Dragons 30 Day Challenge.” It seems to be basically a list of topics for folks to blog/comment about, so we have unified themes for various blogs over the month. So far, there have been some very interesting posts brought about this. I was going to jump on the bandwagon, as I am nothing if not a follower. But, I’m not sure if I have anything particularly interesting to add to the topics. Also, I’m not really in a D&D mood right now (despite one of my favorite games in a while starting up again tonight). 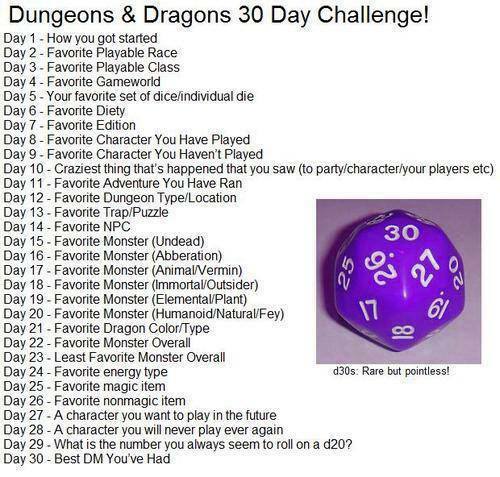 So, I decided to modify it into a 30 Day Challenge for my OTHER favorite game of all time—Vampire: The Masquerade. So, here’s the original “rules” for the 30 Day Challenge. Here’s my initial remix for Vampire. I might need to edit these as I give them some more thought.